Fall brings colorful leaves tumbling from the trees and onto everything below. But as pretty as they are, it's important to be aware that autumn leaves can create potentially hazardous conditions at your home and in your car. Here's what can happen—and what to do about it. If you don't clean your gutters or have gutter guards, wet leaves can get stuck in the gutter, which can limit water flow through the downspout and result in damage to the home's roof, walls, and foundation, as well as mold growth and flooding in the basement. And when water in the gutter freezes, it can form ice dams that can displace shingles and allow water to seep into the home. Remedy: Clean your gutters at least twice a year, or install gutter guards. When leaves get wet, they become much slicker than you may realize, which could lead to slips and falls. Remedy: Use a leaf blower or brush to move leaves off of the sidewalk and onto the lawn, where they can be mulched with a lawnmower to recycle nutrients. "If left on the roof for too long, the moisture from the leaves could cause the wood shingles of your roof to decay," Solon says. Asphalt, clay, and shale shingles can trap moisture; if wet leaves sit on top for too long, the moisture could seep into the house. And metal roofs can corrode over time if wet leaves in the gutter keep the edge of the roofing from drying out. Remedy: Have a professional rake the leaves off the roof and make sure they don't get stuck in the gutters. If leaves sit on the grass for too long, it could lead to yellowing or even the death of the grass from lack of sunlight. Remedy: Chop up the leaves with the lawnmower once a week. Mix the chopped leaves directly into the soil mixture of your flower beds as an additional organic matter to help improve the soil structure and provide nutrients. Or lay the chopped leaves directly on top of the bed and use them as mulch to provide moisture and keep weeds from growing during the winter. "If leaves get wet and sit on the driveway, they can leave a stain. Sometimes you can see an outline of the leaves," Solon says. 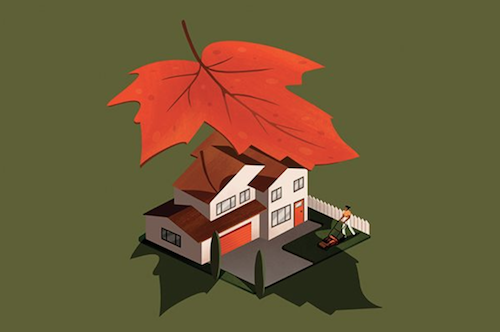 Remedy: Keep your driveway clear of leaf debris. If leaves get into the crevices around the trunk, hood, or where the windshield wipers sit, micro-drains in those areas can back up, which could lead to water inside your vehicle. 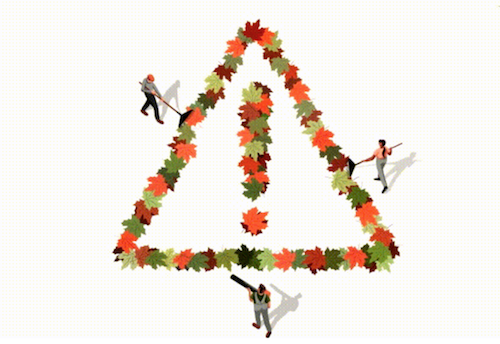 Remedy: Brush off leaves as they fall, before they have a chance to do damage. Ever heard a "flap, flap, flap" sound coming from your engine? It may be the result of leaves getting sucked into the blower motors and the HVAC system. Remedy: Keep the area around the dash (near the windshield wipers) free of leaves and other debris, such as branches and twigs. When it's cool, and the engine is warm, rodents have been known to use leaves to create a nest, then nibble away at the insulation around your car's wiring. Remedy: Check under the hood frequently to make sure there's no leaf buildup or nests under construction. "Leaves are really acidic, especially when they get wet, and if they sit for too long, they can make the clear coat foggy or leave pits," Trotta says. Some leaves come with sap, which can eat away at the clear coat and paint. Remedy: Wash your car regularly. "One of the biggest problems with leaves is that they can make roads really slick," says Trotta. "So you'll need to increase your braking distance." Remedy: Slow down when you see leaves stuck to the roads, and proceed with caution as if you're driving on ice. 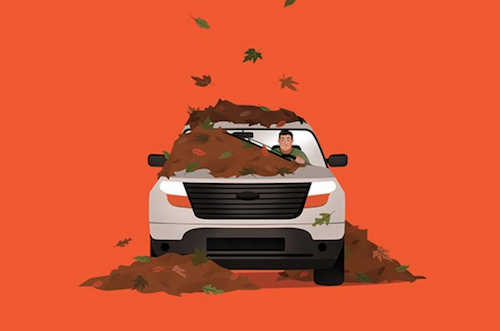 If you see a big pile of leaves, you won't know what—or who—may be in the middle of it, or what it may be covering up. Remedy: If you see piles of leaves, drive around them slowly. If you park on a pile of leaves, you might unknowingly start a fire. "Because of the catalytic converter, the exhaust under your car is upward of 800 degrees," Trotta says. Remedy: Don't ever park on top of leaves, wet or dry.